The surf holidays are open to surfers of all abilities, with easy waves ideal for beginners to powerful point breaks to challenge seasoned surfers. Our expert coaching team is experienced in coaching all level s, including first-time surfers. We offer an introduction to surfing with guidance through the first steps of the learning process. If you are interested in booking one of our Surf camp Packages with a private accommodation or just a single or shared room in a shared house, you are right here. 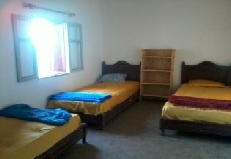 Find the budget accommodation to rent for long stay or short stay in is easily by owners. Find your private vacation rental anywhere you want it. Next to the beach, facing the sea, or in center of the village. You can rent easily your holiday’s lodge directly from the owner. In Agadir Airport, Taghazout, Tamraght, Paradis plages, Imi Ouaddar or Atlantic park. With Sahel Tours is easy to hire car in the spot if you leave in Taghazout, Tamraght, Paradis Plage, Imi Ouaddar ,Madraba, Atlantic park, International camping. You juste need to call our local representative in Taghazout. He come to you, so you can have the car at home. If you come from the Agadir airport, please pre-book your car hire on line. We will put a car in the airport or anywhere you want it. Pick Up & drop off the car easily and gratis. Rent car made quick, easy & cheap when pre-booking with Sahel Tours Taghazout. Don't hesitate to benefit of a low cost quotes and the best deals in Morocco. Logan Dacia, Sandero are the best car hire recommended to explore Morocco. Looking to rent a bus or minibus. Ergtours Agadir & Marrakech can offer you minibus hire at fantastic prices. Modern fleet of minibuses and network of locations or transfer across the Morocco will ensure you have a pleasant experience when renting of us. The bus or minibuses are available throughout the Morocco at cheap rates. Book minibus hire online for lowest prices. Looking for a cheap accommodation, apartments & house, car hire, Taxi transfer, mini bus rental, Surf hostel, shared house or any other service on a budget? Taxi 735 offer executive and standard transfers all over Morocco, specializing in airport collection for both individuals and family. Taxi transfer services to/from Agadir, Marrakech, Essaouira airports, hotel or private residence & cruise port terminal. Book on line your private Taxi and shuttle transfers from the airport, port or from any other popular destinations of Morocco.